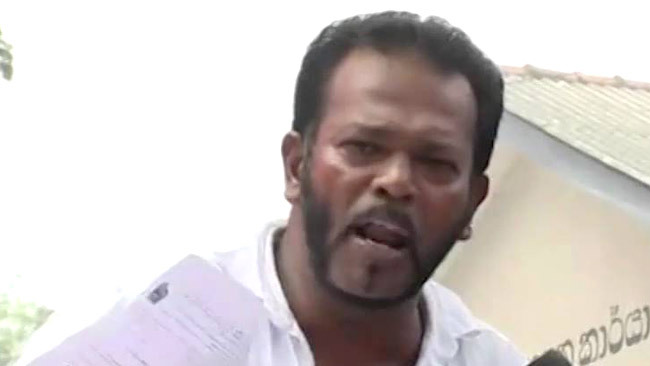 Deputy Minister Palitha Thewarapperuma reportedly walked out from a private hospital in Colombo yesterday despite objections by doctors after hearing the arrest of the mothers of nine students who were denied admission to Grade 1 of the Meegastenna Primary School. Contacted by the Daily News, the deputy minister said he was heading for the Matugama Magsitrate’s Court in support of the arrested parents. Thewarapperuma said he was even prepared to surrender to the Police and added that he would decide on what action to take after reaching courts. He said he was slated to undergo surgery when he heard about the arrest of the parents. Thewarapperuma accused a local politician and some officials of the provincial education office of instigating the whole fiasco for petty gain and as a personal vendetta against him. He said the children had all the qualifications for school admittance. The Police arrested the parents of the nine students denied admission to Grade 1 of Meegastenna Primary School yesterday. The Police said the arrests were made on charges of unlawful assembly and entry. They will be produced before the Matugama Magistrate. On June 27, Thewarapperuma drew attention to the issue, by embarking on a satyagraha that culminated in a bid to commit suicide four days later. The deputy minister speaking on behalf of the parents of the 10 students denied admission said that the students had met all the requirements set out by the school, and that the school authorities’ refusal to grant them admission was unfair and arbitrary. The arrest of the parents comes on the heels of a protest by the All Ceylon Teachers’ Union asking that the deputy minister be investigated and arrested for his involvement in the incident. Meanwhile, the mothers of the nine students arrested by the police on charges of unlawful assembly and illegal entry to the Meegastenna Primary school were remanded till July 7 by the Matugama Magistrate. However, upon arriving at the Matugama Magistrate's Court, the Deputy Minister was informed that the Court was closed. This man is an uneducated mentally deranged THUG. We do not want people like this in this government. Therefore the Pm should take a very strict stand and remove him from the post of dep. Minister as well as the UNP if he wants a clean party. Otherwise what happened to MR will happen to Ranil too. The law should be allowed to take its own course without interference. Also the education authorities should tell the people on what grounds admission was rejected so that the people will know. why can't this guy too be arrested for unlawful assembly, exhibition of suicide attempt or whatever? Isn't the law "supposed" to be equal for all? Or are we being teleported back to the "Mara" era where politicians were "above the law" and everyone else? The Law is supposed to be equel to all only in the book,where is the law to the Family who Swindled the Country? I thought this man tried to commit suicide and is seriously ill.
Thewarapperuma has all the rights and freedom to represent those unfortunate students. This is not a big issue and could have been solved without repercussion. Bureaucratic red tape always plunder the innocent and downtrodden. We witnessed the damages done to Mr. MR by his stupid henchmen in cowboy hat. I am asking myself, why the current president Mr. MS is allowing his brainless, uneducated thugs to ruin his name?